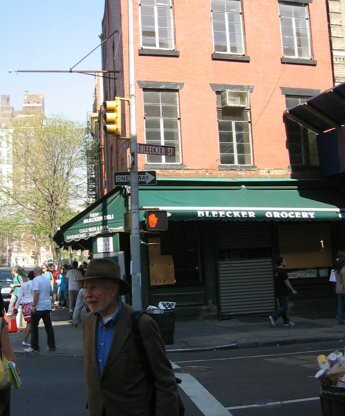 “One of Greenwich Village’s oldest buildings, this corner store was built as a grocery in 1802. Its top floor was reputedly the office of the commission that laid out the 1811 grid plan for the development of Manhattan Island. 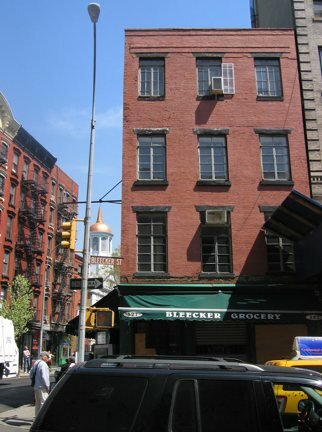 The structure was itself a victim of urban planning; in 1828, when a bend in Bleecker Street was eliminated to facilitate the smooth flow of traffic across Christopher Street, the store lost 20 feet of its width. 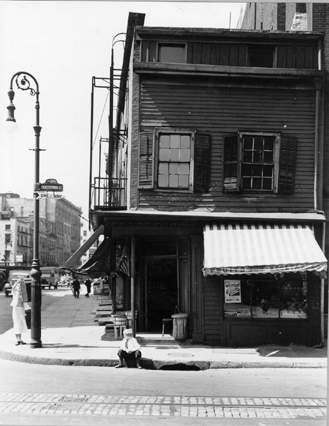 Abbott’s photograph clearly shows the brick wall, extending beyond and above the old clapboard structure, which marks the building’s 1828 truncation. I don’t know when that was written because here it is now. It stayed a grocery until recently, and I’m not sure when it closed to tell you the truth, even though I must pass it close to every day. And it’s completely changed. It’s a three story brick building. I love that it remained a grocery for so long though. 200 years at least. Sigh. I wish there were more “clapboard” buildings. I found a pretty yellow one a block away that I took a picture of that I will post another time. My neighbor Beth found pictures of Perry Street and Hudson that I’m going through now. I love doing these “then and nows”. I’ve got a shot of St. Luke’s on Hudson that I want to do a then and now on. I’ve got a pub date for my book now! It’s March ’09. That may seem like far away, but for me it feels like tomorrow practically. I have to start planning what I can do to publicize it and that actually takes a long time to do and then act on. Lots of things have like a three to six months lead time, so I have to think of things and start putting them into place in September. But other than that my “to-do” list is remarkably short. I have a terrible memory so I have to write everything down. I have a small spiral notebook always, where I have a running list of things I must do. I put a “1” next to the things that are most important and I always do those first whether I want to or not. Here is my current list and which are marked with “1’s”. – Call to get windows cleaned. – Call Tommy Wray (he’s a retired cold case detective). – Call Kaplan (another cold case detective, not retired). – 1 Sources section (this comes at the end of the book, where I list where I got the information in each chapter). – 1 Doug passes (for choir seats.). – 1 Author questionnaire (for publisher). The grocery, which everyone referred to as “The Koreans’,” suddenly closed sometime in the Spring of 2007. One day it was a grocery store with a Sikh guy out front selling costume jewelry, the next minute it was boarded up like that and Andrew Kurtzman from NY1 was standing in front of it doing a story. Hi Melinda, thanks for filling us in! Sad. I hope it remains a grocery store. They must be asking some outrageous rent for it still to be empty like this.